ABOVE: Award-winning retailers such as Wensum Pool, maximise the potential of add-on sales with attractive showroom displays. Think about your last big investment, say, a new car. While you may not have been thinking about accessories such as floor mats or mud guards at the time of purchase, the mention of it during the process can trigger valuable add-on sales income. It’s very much the same in the hot tub industry, where, by offering anything related to spas, savvy dealerships can boost their revenue this season. That is, if you can offer the right mix of products. It’s a view echoed by Aqua Warehouse Group, one of the industry’s leading distributors of associated hot tub accessories and add-ons. “The add-on sales and after sales market in the hot tub industry is much bigger than a lot of retailers realise,” explains Managing Director Richard Hart. 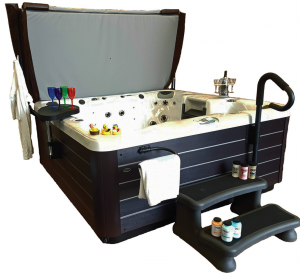 Aqua Warehouse believes it’s very important that customers see, feel and understand the value of such items and the best way to achieve this is by dressing your spa in your showroom. Richard explains: “As a supplier of accessories, it’s noticeable that the dealers that display and promote are the ones that gain additional revenue. “So, install a cover lifter, add steps, towel rail, hand rail, and place a wine cooler on the side with acrylic glasses and so on. Customers want to purchase what they see, so show them a completely dressed spa. “It’s also important to not ignore your existing customer database with ongoing accessory sales. We have done some basic sums and worked out that the average customer spends approximately. £350 a year on accessories and consumables for their hot tubs.” This figure includes filters, chemicals, cleaning products and fun stuff, as well as £100 towards a £400 cover every four years. For a company working with 600 customers, that’s potentially £210,000 of extra revenue. “This is a vast sum and doesn’t include any online business that a lot of companies totally miss out on,” adds Richard. This year, hot tub owners are looking to do much more than simply enhance their spa with fragrances or cleaning products. Instead, they are looking to transform their outdoor living areas. However, a recent report shows they would like to go one step further than this. The 2019 Pinterest Trends Report highlights an increased interest in indoor-outdoor living (ie creating an indoor living experience outside). Take heating, for example. The social media channel has experienced 1718% more searches for ‘contemporary fireplaces’ – including firepits. As customers look to bring heat into their gardens, research like this indicates that they Likewise, there’s been growing interest in outdoor cooking and dining areas. Popularised by TV chefs such as James Martin and Jamie Oliver, pizza ovens offer and smokers offer great alternatives to the traditional charcoal BBQ. “When you buy a pair of glasses, you’ll need a case to protect them, too. And that very same principle applies when owners invest in a hot tub,” points out Golden Coast director Dominic Adams. “But it doesn’t stop at the cover. By really considering what your customers will want, need and expect, you can keep one step ahead… and it’s that kind of thinking which led to the creation of Essentials.” Essentials is Europe’s largest range of pool and spa accessories available through one supplier. 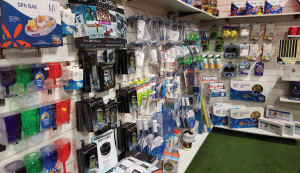 Dominic explains: “Many items in our Essentials range are impulse buys for customers already visiting your shop to purchase water balance products or sanitisers. 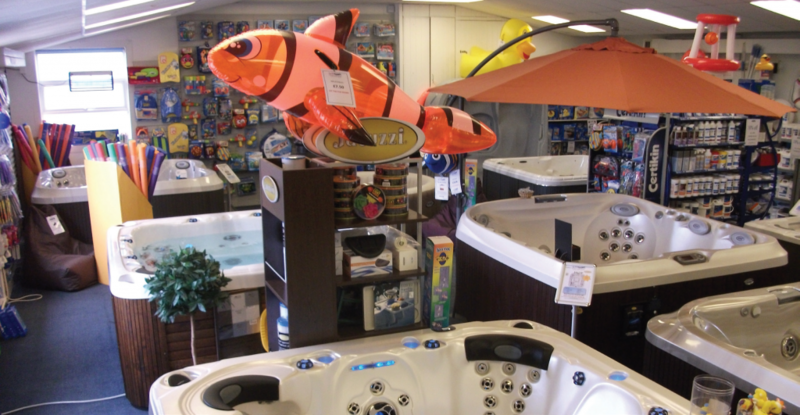 He adds: “Make sure customers see the range of accessories available to enhance their spa experience and make the purchase there and then.” “As well as ensuring tubs are displayed well in the showroom, your sales staff should be engaged with selling accessories – not just hot tubs,” advises Dominic. But it shouldn’t stop there. He suggests: “You should also get your installation and service engineers following suit. An engineer talking positively to a spa owner about accessories will have an impact. Because hot tub accessories are not seasonal, this business can generate a year-round income. Seasonal promotions are one way of encouraging this further. Golden Coast suggest that cleaning products can be promoted in the spring, while cover caps are better push as we head into winter. Each year the team at Golden Coast scours the globe for accessories which will add real value to hot tubs. “Based on the latest additions to this constantly growing range, 2019 looks set to be our most exciting collection yet,” enthuses Dominic. Responding to popular demand, Golden Coast has extended its range of cover caps with two new sizes available (200 x 200 cm and 210 x 210 cm) for both cap and protector. In addition, Golden Coast has extended its selection of fragrances for hot tub fragrances with. InSPArations Its popular pearl liquids, which are available in 12 scents. For 2019, this has been enhanced with the addition of crystals in two sizes (5 oz and 11 oz).